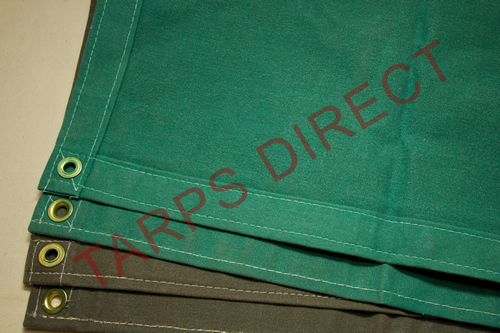 Tarps Direct’s 15 ounce canvas is manufactured from 100% cotton fabric. Treated to be water resistant, breathable and strong; our canvas tarps have double stitched seams and hem with brass grommets approximately every 24" apart on all sides and corners. Canvas tarps are good for covering non-moving items. They also reduce condensation because canvas is breathable. Water resistant treatment produces an odor in cotton canvas tarps that may lessen over time. Please note canvas tarps are listed as a cut size – finish size is 6" or 3%-5% smaller. Flame-retardant and custom sizes are available. Please call for pricing and delivery. Water resistant treatment produces an odor in cotton canvas tarps that may lessen over time. 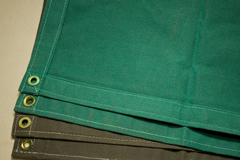 Tarps Direct’s 15 ounce canvas is manufactured from 100% cotton fabric. Treated to be water resistant, breathable and strong; our canvas tarps have double stitched seams and hem with brass grommets approximately every 24" apart on all sides and corners. Canvas tarps are good for covering non-moving items. They also reduce condensation because canvas is breathable.